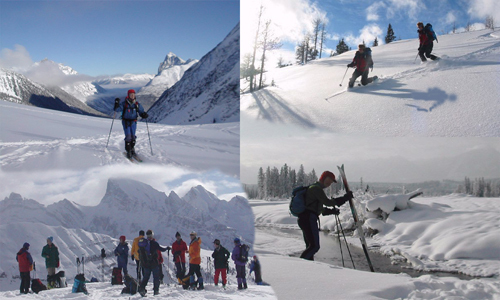 Rogers Pass & Hwy 93 N backcountry ski trip with Rocky Mountain Ramblers Video Carol Guthrie B.C. 2019/01 12 3 1 0 Rogers Pass & Hwy 93 N backcountry ski trip with Rocky Mountain Ramblers. Ramblers Dave Henry Skiing Video Carol Guthrie B.C. 2018/03 22 24 7 2 A Rocky Mountain Ramblers ski trip into Dave Henry Lodge in the Caribou Range outside of Valemont, B.C. Whistler Video Carol Guthrie B.C. 2013/01 14 64 4 4 Whistler skiing. Rossland Skiing Video Carol Guthrie B.C. 2010/12 5 107 7 2 Skiing at Red Mountain. Paradise Valley 2010 Video Carol Guthrie Alberta 2010/02 8 51 3 2 A beautiful skinny-ski day trip up Paradise Valley in Lake Louise. An 8 minute video. Sol Mountain 2010 Video Carol Guthrie B.C. 2010/02 21 98 8 2 Thrills and chills. 21 minutes of cool helicoptering, telemarking, and AT skiing. Amiskwi Lodge Video Carol Guthrie B.C. 2009/02 20 58 3 2 Norseman Ski Club at Amiskwi Lodge. Chickadee Valley Video Carol Guthrie B.C. 2009/01 5 48 2 2 Five minutes with the Norseman Ski Club at Chickadee Valley. Ice Fall Lodge Video Roy Scarisbrick B.C. 2008/12 22 43 4 2 A week's skiing at Icefall Lodge. Norseman Presidents Day Pictures Carol Guthrie Alberta 2008/03 25 2 2 A few pics. Monashee Chalet Pictures Carol Guthrie B.C. 2007/02 30 3 2 A few pics. Sol Mountain 2006 Video Carol Guthrie B.C. 2006/12 12 55 10 2 Great powder days at Sol Mountain Lodge. Mostly AT skiing - not much tele. Mount Assiniboine 2006 Pictures Carol Guthrie B.C. 2006/03 38 3 2 Beautiful touring and telemarking in Mt. Assiniboine B.C. Provincial Park. Dolomite Circuit Video Carol Guthrie Alberta 2006/03 8 14 3 2 A sunny day around the Circuit. Nice telemarking. Sue Foley all the way. Mount Assiniboine 2006 Video Carol Guthrie B.C. 2006/03 17 23 3 2 Beautiful touring and telemarking in Mt. Assiniboine B.C. Provincial Park. 17 minutes on a Canon tape. Chickadee Valley 2006 Pictures Carol Guthrie B.C. 2006/02 28 2 2 A few pics. Crowfoot Pass Pictures Carol Guthrie Alberta 2006/01 23 2 2 A few pics. Sunshine Weekend 2006 Video Roy Scarisbrick Alberta 2006/01 8 14 7 2 ("Diamond Sun") Touring and beautiful telemarking from Sunshine Village. What a party (-ouch). Some footage from 2005. 8 minutes with Glass Tiger. Norseman Ski Trips Pictures Carol Guthrie Alberta / B.C. 2006 / 2007 13 2 2 Pictures from three Norseman trips over the 2006 / 2007 winter. Boxing Day 2005 Pictures Carol Guthrie Alberta 2005/12 11 2 2 A few pics. Crowfoot Pass & Dolomite Pass Pictures Carol Guthrie Alberta 2005/03 12 2 2 A few pics. French - Robertson Video Roy Scarisbrick Alberta 2005/03 9 23 2 2 There probably aren't many movies about the French - Robertson loop - certainly not as fuzzy as this one, with Led Zepp and AC/DC. Catch the world's biggest wind scoop and all those K-Country peaks. Sunshine Weekend 2005 Pictures Carol Guthrie Alberta 2005/01 9 2 2 A few pics. Norseman New Members Video Carol Guthrie Alberta 2004/12 5 8 2 2 Five-minute bus tour. Larry makes us late. Bow Hut 2004 Pictures Carol Guthrie Alberta 2004/04 20 2 2 A few pics. Campbell Icefield Pictures Carol Guthrie B.C. 2004/03 24 2 2 Four pages of our first week at Campbell. Campbell Icefield Video Carol Guthrie B.C. 2004/03 33 26 3 2 Our first full production. A full-length detailed journal of a Norseman ski week. There's some deep, dry telemarking and paralleling going on here. Paradise Valley 2004 Pictures Carol Guthrie Alberta 2004/01 9 2 2 A few pics. Golden New Years Pictures Carol Guthrie B.C. 2003/12 9 2 2 A few pics. Trywhitt - Whiskey Jack Pictures Carol Guthrie Alberta 2003/12 7 2 2 A few pics. Bow Hut 2003 Pictures Carol Guthrie Alberta 2003/04 18 2 2 A few pics. Mount Assiniboine 2003 Pictures Carol Guthrie B.C. 2003/03 14 2 2 A few pics. Norseman Lake Louise Pictures Carol Guthrie Alberta 2003/02 9 2 2 A few pics. Avalanche Awareness Training Pictures Carol Guthrie Alberta 2003/01 16 2 2 A few pics. Rogers Pass Pictures Carol Guthrie B.C. 2003/01 30 2 2 A few pics.